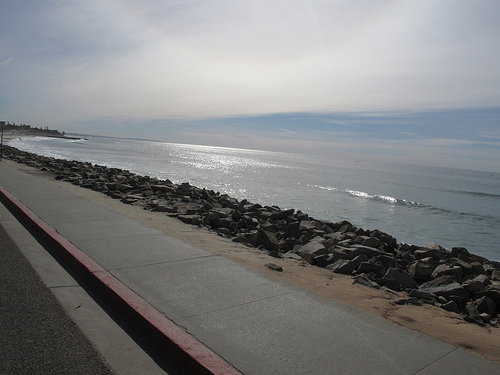 Riding along the coast in Carlsbad. As someone who runs a high-end road bike rental company, I am often asked where to ride while my customers are in town. For some areas, this is a very easy question to answer while other areas pose problems. Not all areas have large numbers of rides easily accessible from the hotel where a customer is staying. Fortunately, most of San Diego County, especially the north county, has thousands of bike rides that are accessible from your doorstep. One local club, the North County Cycle Club (NCCC), rides the roads of the north county of San Diego all the time with occasional trips up to south Orange County through Camp Pendleton. Someone with the club has put together an incredible resource for cyclists that allows you to search for San Diego County bike rides based upon your start site. 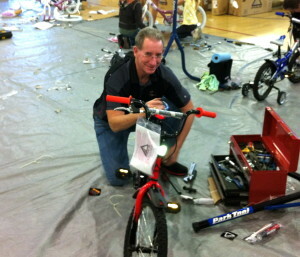 It can be found here: http://bike.fullcommitment.net/. Camp Pendleton. Watch out for tanks! The best part of this link is that it provides you with a map of San Diego County with potential start sites highlighted in red. Click on the red dot and you can see a list of rides from that spot. Click on the ride link and you’ll find a small map of the ride. Click on the “view full route” link and you’ll get a larger map and printable cue sheet. 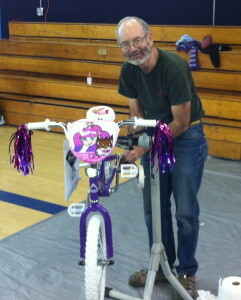 Other resources for rides can be found here: http://socalcycling.com/training-rides/. Here, you’ll find a list of regularly scheduled training or group rides that are a lot of fun, especially if you want to find a more competitive ride. Having grown up in the north county of San Diego, I can be a bit biased. I feel that for the sheer number and variety of bike rides, it’s pretty difficult to beat this are for riding on the road. Though some roads are high traffic, there are plenty of wide bike lanes, and it’s pretty easy to find lower traffic areas to ride, as well. We occasionally run into products that we just plain love. Every product from the Sock Guy that we’ve tried thus far has been fantastic. Here, we wanted to give you a quickie Sock Guy SGX socks review. While we’re not sure what they mean by “elite athlete”, we can honestly say that these socks are great for the non-elite among us, as well. First and foremost, the material is thin without feeling flimsy. 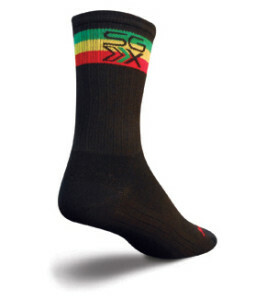 Since many cyclists do not like thick, bulky socks, this is a good thing. The second thing you notice about the fit of these socks is the compression fit. They don’t feel constricting, just a bit of compression. They simply feel great on your foot. You can feel the nice, even compression over your entire foot. Though the effects of compression on your foot might be debatable, the one effect that it has here is that it gives these socks an exceptionally close fit to the foot. 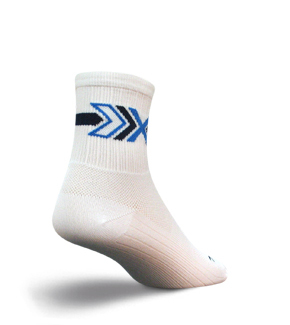 There’s not much chance that this sock will bunch up and create hot spots during exercise. Additionally, the toe seams lie flat and don’t irritate or rub like some socks can. This is especially important for me as a scar on the top of my foot seems to get irritated easily for poorly placed toe seams. Sock Guy indicates that these socks have enhanced ventilation and reduced friction profiles. This does seem to be the case. I wear these socks on a daily basis while riding, running, coaching soccer, running errand s, you name it. I have done a lot while wearing these socks and have yet to develop a blister while wearing them or have my foot be clammy upon removal of the sock. 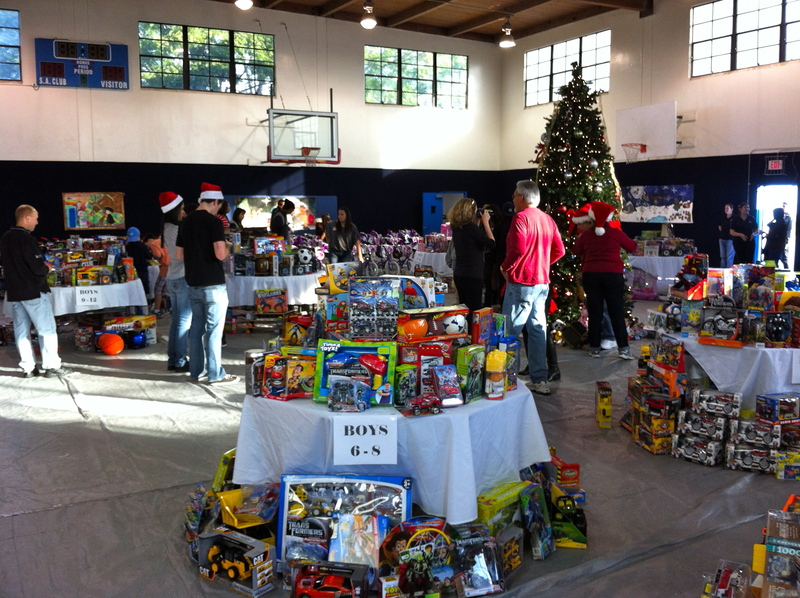 They do everything that the company has indicated and more! While just making a sock that has all these characteristics would be quite the feat (no pun intended! ), Sock Guy offers their socks in a number of different flavors. They have an incredible array of designs and offer their socks in a broad range of cuff lengths, from no cuff to 3″ to 5″ and all the way up to knee high. So, if these socks become your favorites, you’ll have plenty to choose from! We offer these socks in our online shop (http://synaptic-cycles-shop.myshopify.com/collections/cycling-clothing) so you may think we’re a bit biased, but that’s not the case. If you see us out and about, we will generally be wearing these socks (except with flip flops, not a good look!). We love them or we wouldn’t sell them. Give them a try. We think they’ll become your favorites, too. If you’d like to see other options made available, let us know and we’ll see if we can get some in stock. 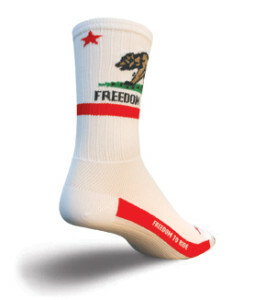 If you’re not interested in socks, and just want to hop onto a bike in OC/San Diego or Los Angeles, please contact us ASAP! Thoughts on Hydration While Cycling…. A recent heat spell while coaching my kids soccer team got me thinking about hydration issues, and led to thoughts on hydration while cycling. As most soccer parents know, parents often “thoughtfully” bring gatorade to games and practice so their kids can stay hydrated. Most days, this is not much of a problem unless it gets hot and the kids sweat a lot more than usual during practices and games. I kept finding that my sons would get home after practices and games and would start complaining of headaches and sometimes a bit of nausea. It seemed that they were drinking plenty at practice and games, but it still wasn’t enough. I was able to put a stop to a lot of this after putting a lot of thought into my own hydration issues while cycling. Cycling in the heat for long periods of time can deplete you over time as you sweat. Unfortunately, it’s not just water that’s lost. It’s electrolytes, as well. So, how do you deal with this? First and foremost, you have to hydrate BEFORE you exercise. This does not mean that you should chug a gallon of water immediately before you go out and exercise. It means that you should be be drinking enough throughout the day, every day, to keep yourself adequately hydrated. Think of this as pre-hydration. Just drink enough water throughout the day and many of the issues with dehydration can be avoided. Now, when you’re working pretty hard, you sweat. Sweat is salty. Your sweat contains the electrolytes sodium and potassium. A liter of sweat contains a whopping 800 mg of sodium (~50% of your daily intake of sodium), but less that 150-200 mg of potassium (~2.5% of your daily intake). Over the course of an hour of exercise, you can sweat a liter or more. Now, consider what happens when exercising for several hours. You’re losing a lot of water and a lot of sodium, and over time a lot of potassium. Gatorade doesn’t contain enough sodium to properly replace the amount of sodium you lose while from sweating during exercise. Now, let’s take a look at the staple of sports hydration everywhere, Gatorade. In an 8 oz. serving of gatorade, in addition to water, you get 110 mg of sodium and 30 mg of potassium. You also get some sugar and some nice dye. Is this enough? According to the American College of Sports Medicine, a sports drink should contain 125-175 mg of sodium / 8 fl. oz. and 20-48 mg of potassium / 8 fl. oz. Gatorade gets you close, but not close enough. There’s more than enough potassium in Gatorade, but the levels of sodium are not high enough to replenish the amount of sodium that’s being lost. This is especially true when you consider that many people dilute their gatorade with water because it’s too sweet to drink while riding your bike. So, if you use gatorade for hydration, you might want to dilute it so it’s drinkable and then add some table salt to up the sodium content. Camelbak Elixir has 140 mg of Sodium and 23.3 mg of Potassium per 8 oz. serving. During long days on the bike, I have experimented with several electrolyte replacement methods. A few electrolyte replacement drinks that have worked quite well for me are Nuun and Camelbak Elixir. Both have enough sodium and potassium to satisfy the American College of Sports Medicine’s recommendations. As a side benefit, they also have no real caloric content, which allows me to better regulate caloric uptake while riding. 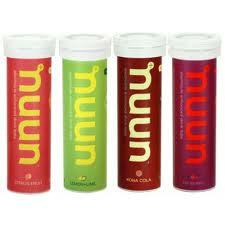 Nuun contains 172 mg of Sodium and 38.8 mg of Potassium per 8 oz. serving. Now, everyone is different. Some people sweat less than others. Some people’s sweat contains more or less electrolytes than others, so your experiences might differ. I know several people who do just fine with diluted Gatorade without adding salt. This post is really aimed at people who are more sensitive to hydration differences and especially to those who deplete themselves of electrolytes during exercise. So, back to my kids soccer exploits. I put my own findings to the test for them. Making them drink plenty of water throughout the day, especially the few hours leading up to their practices and games helps out a lot. I also give them a 24 oz. water bottle of Nuun to take with them and drink during these times. I also make sure they hydrate with more water for several hours afterward. When I keep them on top of their hydration, they avoid the post-game dehydration headaches and feel better during their games, as well. As I started working on this post, I came acoss a great write up on Hydration Myths written by John Hughes. 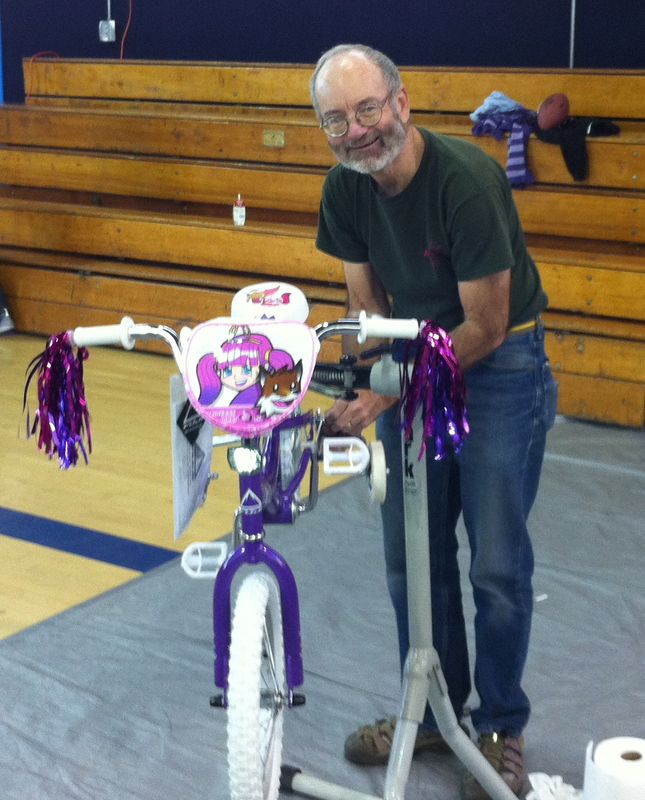 John Hughes is the former director of the UltraMarathon Cycling Association and editor of UltraCycling, and he has been certified by the National Strength and Conditioning Association as a personal trainer and by USA Cycling as a coach. Much of what I spoke about is supported by what he wrote. You can read his article here. 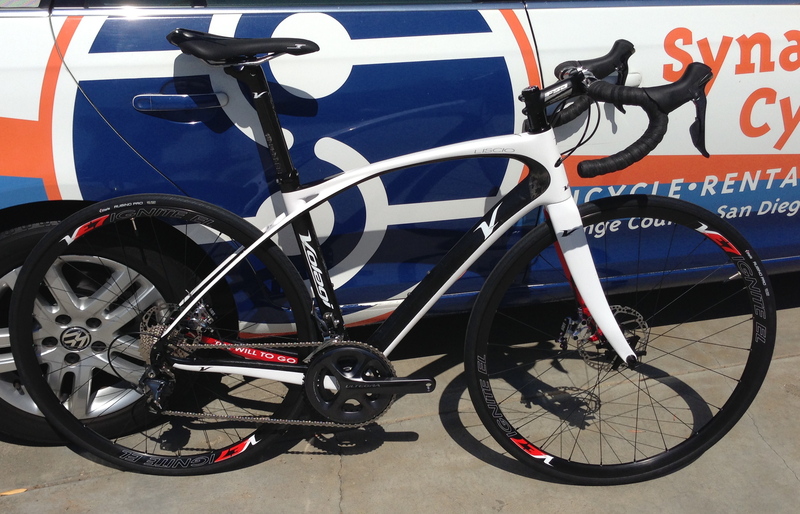 New Volagi Liscio 2 with Ultegra 11 and TRP Hy/Rd hydraulic disc brakes. We have been a Volagi dealer for over a year now. As a road bike rental company, our model has been to demo bikes such as the Volagi Liscio, renting them to customers before they spend their hard-earned money on a new bike. Here, we take a look at one of our brand new Volagi Liscio demos. The Liscio 2 front end, showing the internal routing of the cables. A few weeks back, we took delivery of a brand new Volagi Liscio 2 with the new Ultegra 11 speed group and the TRP Hy/Rd Hydraulic disc brakes. We’ve always loved pulling the new Volagi bikes out of the box, and the new Liscio 2, with internal cable routing throughout, has a nice, clean look. We ordered this newest bike with the new Shimano Ultegra 11 speed drivetrain and the new TRP Hy/Rd hydraulic disc brakes. The end result is a stunningly beautiful and functional bike. The white on black colorway with red trim inside the fork and rear stays is really complemented by the finish of the Ultegra gruppo. 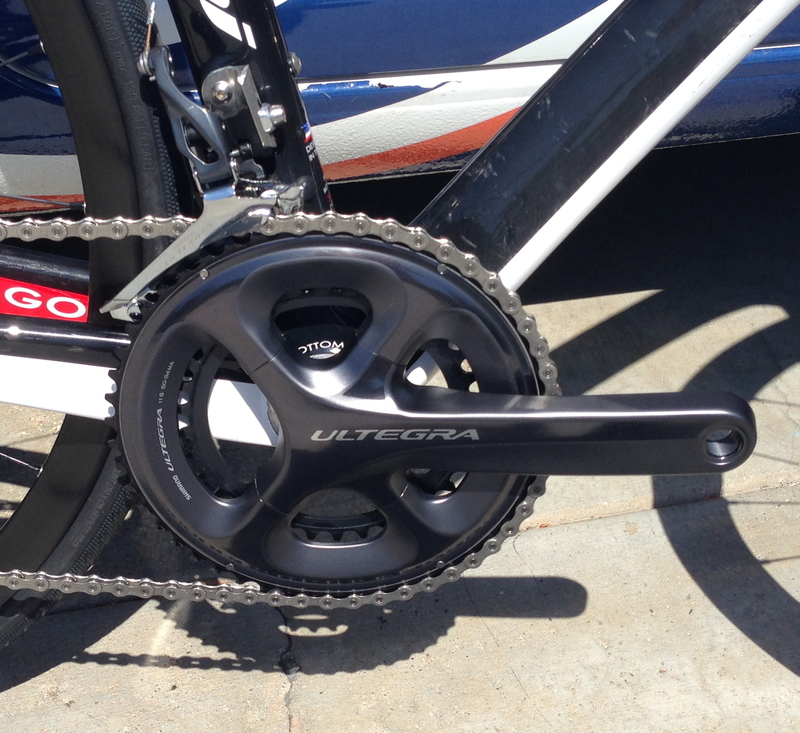 The Ultegra 11 crankset features a new 4 arm spider that accepts chainrings for either compact or racing drivetrains. The Ultegra 11 crankset has the same, new 4-arm design as Dura Ace, and it allows standard or compact gearing without having to purchase new crankarms. This simplifies things greatly and allows for easy conversion should you decide to change up your front-end gearing. 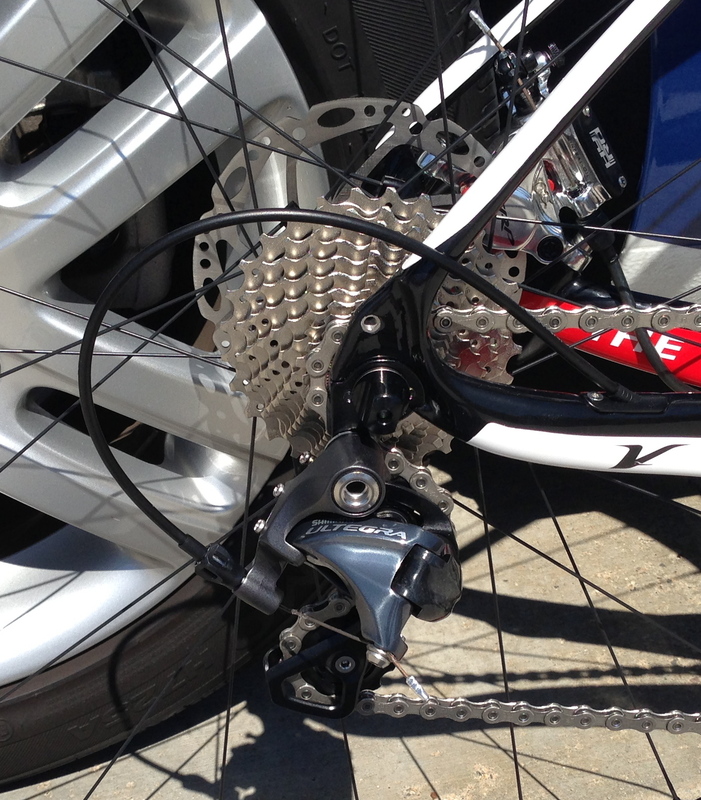 Below is a close up of the new Ultegra 11 Rear Derailleur. 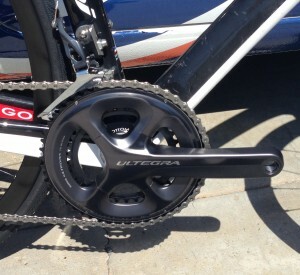 An option on Ultegra 11 is a longer cage derailleur, which allows for the use of an 11/32 cassette. For those riders who have been using road triple drivetrains, this will allow for similar gearing options when coupled with with compact gearing up front. The added benefit of this option is an increase in shifting simplicity over road triple options. The new Ultegra 11 rear derailleur comes in a longer cage option that allows for the use on an 11/32 cassette for lower gearing options. The TRP Hy/Rd hydraulic brakes are cable-actuated and have the hydraulic reservoir built into the calipers, allowing for the use of standard brake levers. 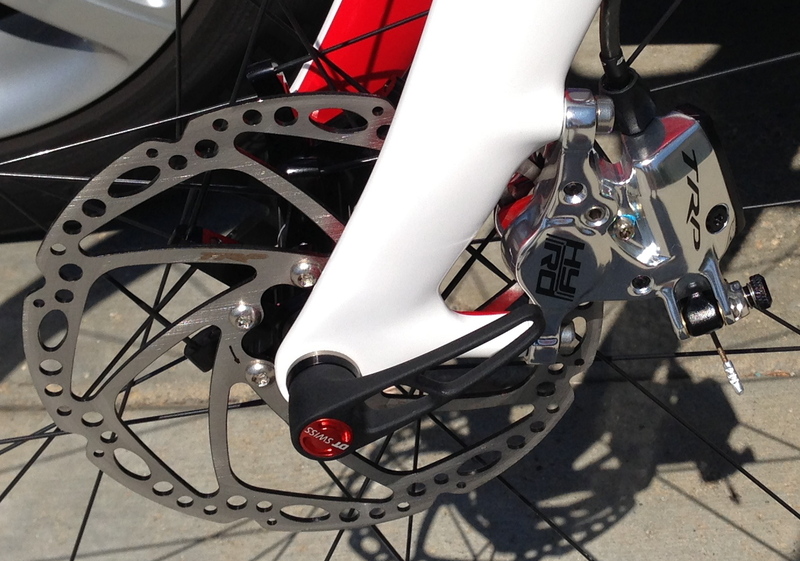 The braking feel is similar to that of rim brakes, but provide much better stopping power. This will be especially noticeable to riders who lack hand grip or have smaller hands. This cable-actuated hydraulic brake system also has some side benefits over full hydraulic systems. 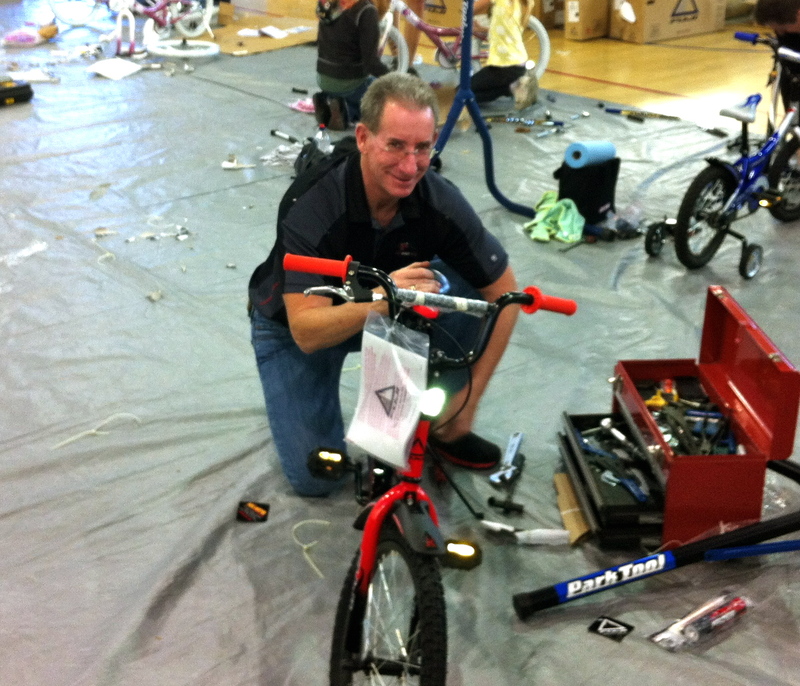 This system doesn’t require special hydraulic brake levers. Given the ugliness of the new hydraulic road levers, this is a big benefit! Additionally, you don’t have to worry about hydraulic lines running the length of the bike, and it also negates the chance of losing your brakes after a crash when your levers get take a big hit. Also, should this happen, it’ll be much cheaper to replace a standard cable-actuated lever than a hydraulic lever. 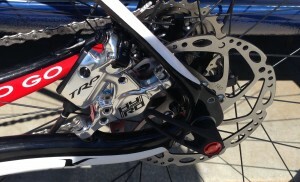 The Hy/Rd rear brake caliper. The brakes feature pads that move independently and provide strong, noise-free braking. For some of our repeat customers who have ridden the mechanical disc-equipped Volagis, this is a game changer. 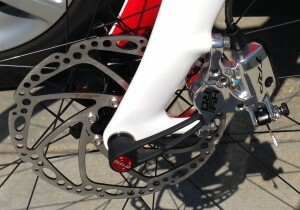 Most have commented on the fact that the brakes feel “normal” but have greater stopping power. So how does all this go together? The Ultegra 11 speed group is amazingly swift shifting, with a very light feel at the lever, compared to previous versions of Ultegra. This is immediately apparent in the repair stand and on the road. The movement from one gear to the next is fast and crisp. Front shifting is simply amazing! The trickle down from the Dura Ace 9000 mechanical group is apparent. 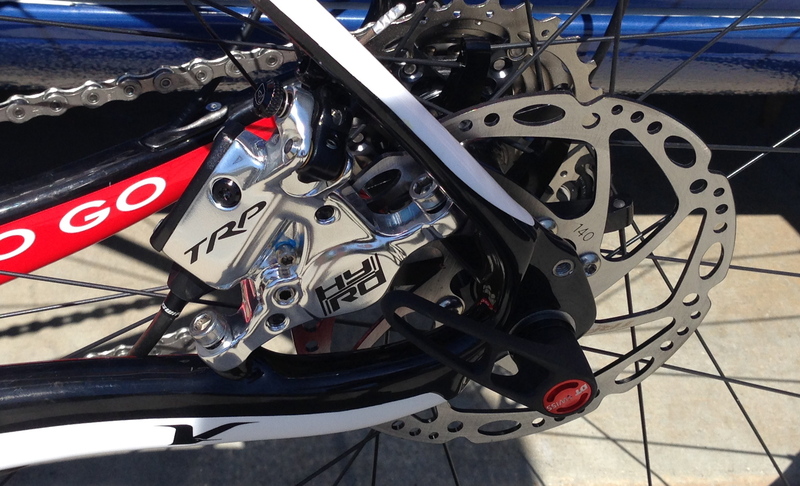 Coupled with the new Hy/Rd brake system, these bikes are a dream to ride – great shifting, coupled with great braking. Add in the plush ride of the Volagi frameset and you have a bike that you’ll want to be riding all day long. If you’d like to do a Volagi Liscio demo, give us a call (949-374-6079). You can read more about our demo process and how it works here (http://synapticcycles.com/calfee-and-volagi-demo-bikes/). This is a follow-up to the earlier bike tire review where I gave my initial impressions of the Grand Bois Cerf tire. Okay, I wasn’t sure about the switch to these tires. I am a bit of a fuddy duddy when it comes to tires. I tend to ultimately stick to tires I’ve used in the past even though I occasionally try (waste my money on) other tires. Most often, I end up on Continental Grand Prix 4000s or Ultra Races or Vredestein Fortezza Tri-Comps. Everything else that I’ve tried up to now feels slower or doesn’t corner well. There was the time where some Avocet FastGrips took me down on a slick road at 35 mph. Then there’s the sluggish ride of the Specialized Roubaix tires (unless you pump them up to ungodly pressures, but then what’s the point in riding a higher volume tire?). Anyway, you get the point. Now, I’ve come to the Grand Bois Cerf Green Label (28C width). They are puffy, measuring slight wider than it’s stated size of 28C (28.2mm on my DT Swiss RR 1.1s), pumped up to about 95 psi. They roll quietly and comfortably, absorbing quite a bit of the road shock. They take the edge off expansion gaps and roads that have small rises in the pavement due to underground roots. This is great, but there’s always a trade-off in speed, right? Wrong. On three separate rides when I first got them, they have proven to be faster. On my first commute on them, I easily managed a bit over 17mph round trip when I had been working pretty hard to go 16mph round trip. On a 32 mile ride over the weekend, I rode 18mph over a 32 mile course that I usually have to work hard to stay over 17.5mph. Then, this morning I just flew in to work, getting here about 5 minutes faster than average. Granted this is a small sa mple, but it indicates why I may have found a new “go-to” tire. I now have completed a few years of riding on these tires. Lately, I have been mounting them up the HED Jet 4 rims or the HED Ardennes wheels. These rims are the newer 23mm width rims. When these tires are mounted on these rims, the wider rim allows the tire to “round out” , providing a nice round profile. Shown on the right is the GB Cerf mounted on the HED Jet 4. It’s difficult to see, but the tire is nice and round when mounted on this rim (See the picture on the right). The Ardennes imparts the same profile to the tire. I have completed multiple double centuries on these tires and have found them to perform well. Fast and comfortable! For those who want to know about the actual width of these tires, you can see in the next picture, that the tire measures just over 29mm when mounted on the HED wheels. It should be noted that most newer bikes will not accept tires this width unless specifically built to accept larger tires. 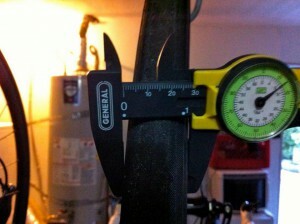 For example, one of my racing bikes has an Easton EC90 fork. The Cerf Green Label does not fit into this fork, Fortunately, the Grand Bois Cerf Blue Label (26C) tire measures out at ~27mm wide on the HED rims and fits just fine, giving a nice round profile as well. So, if you’ve read this far, you’re likely wondering why you’d want to try these. 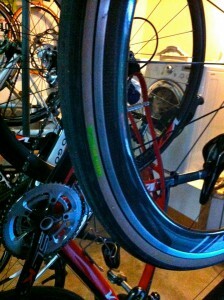 First, my experience with these tires indicates that they are actually faster than most other tires that I have tried. Second, they are higher volume tires. This means that tire pressures can be lowered without giving up speed. I weigh 185lbs and I typically ride mine at 85psi rear/80psi front, and this provides a very comfortable ride without any reduction in speed. Third, their nice, round profile when mounted seems to make them much more predictable in corners. This is a subjective thing, but I feel much more confident during hard cornering on these tires than I do on most other tires. Okay, negatives? Well, some claim that these tires are prone to flats. 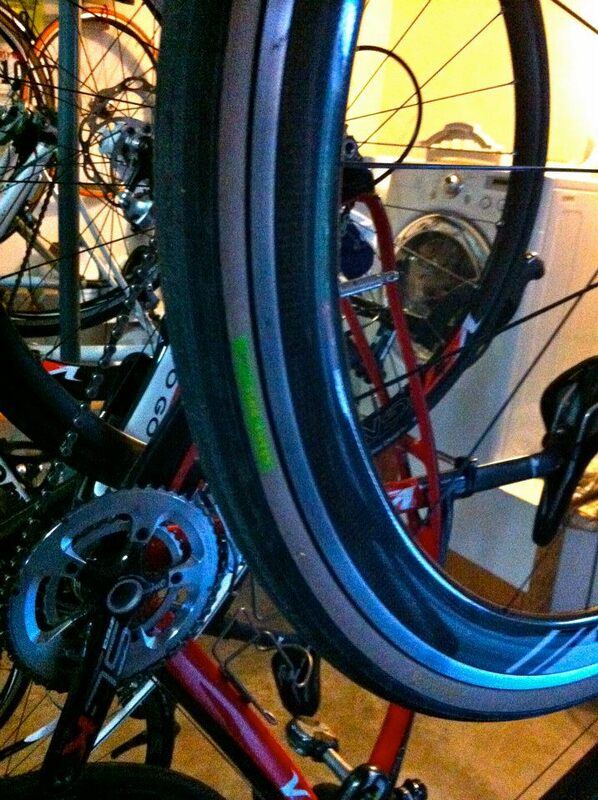 While I have flatted on them, I have not noticed them to be especially flat-prone. Though, if you tend to ride on glass-strewn or thorn-covered roads, these might not be the tires for you. If you tend to be careful about what you ride over and check your tires for debris after ride, you will probably do fine on this tire. You can buy them here on(http://www.compasscycle.com/tires.html). Please, note that I have no skin in this game. I don’t sell these tires and don’t get any money or freebies from Jan Heine or Compass Cycle.